In this paper, text visualizations are used to analyse the acceptance speech given by Barack Obama at the Democratic Convention on 28 August 2008. Five information graphics visualize syntax and pragmatic elements: The visual comparison of words or text fragments provides details about text structure, writing style and content. By filtering, mapping and translating text into graphical structures, large amounts of information can be concentrated into a small space, thereby allowing us to grasp overall structural elements at a glance. This is why text visualizations can be useful as an additional method for analysing a text or a text corpus. Furthermore, the quality of an information graphic is to transform facts into communication in a quick, compact way. The study of the sign process points out the significance of graphic design abilities using type, space, image and colour to layout information. These different modes of communication work together to convey meanings. 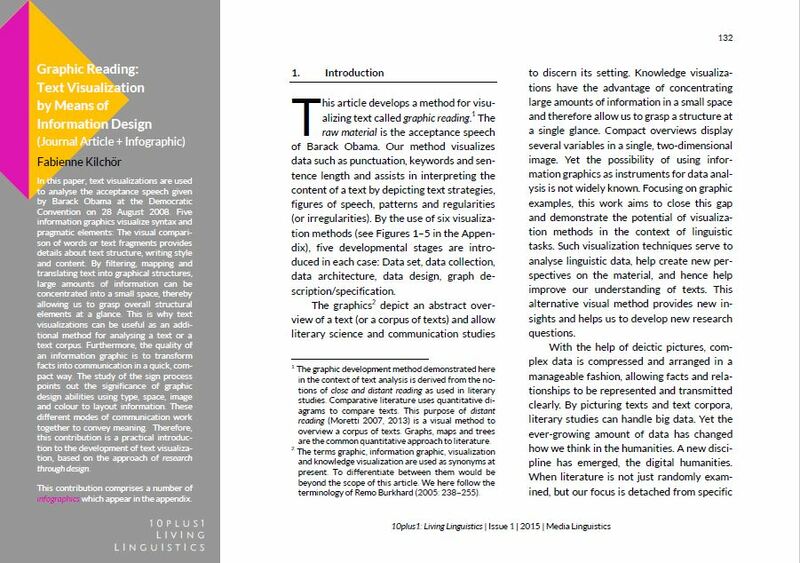 Therefore, this contribution is a practical introduction to the development of text visualization, based on the approach of research through design. Fabienne Kilchör is co-founder and creative director of the graphic design agency Emphase GmbH in Lausanne, design research fellow in the field of Knowledge Visualization at the University of Bern and Head of studies for the Certificate of Advanced Studies (CAS) in Data Visualization at the University of the Arts Bern as well as lector at the Geneva University of Art and Design. In 2006, she graduated in visual communication at the HEAD-Geneva. After several years of experience in an agency for communication design, she founded in 2010 her own atelier for graphic design and data visualization together with her business partner and two employees. As a design researcher she initiated and lead from 2008–2013 research projects in the field of Knowledge Visualization at the HKB Bern. Since 2013, Fabienne has conducted her own PhD studies on the subject of Knowledge Visualization at the University of Bern about Graphic Reading and Cultural Heritage Visualization. She is a lector for Informationdesign at the HEAD-Genava. Since 2015, Fabienne has been Head of studies for the Certificate of Advanced Studies in Data Visualization at the HKB-Bern.